forums.silverfrost.com :: View topic - %pl - suppress tick-numbers ? Posted: Mon Sep 03, 2018 4:15 pm Post subject: %pl - suppress tick-numbers ? The only unbeautiful thing is, that the tick-numbers lay in the space of the figure. Has anybody an idea to prevent these tick-numbers? My intensive search in the forum to find a solution failed, sadly. The %pl option [external_ticks] might be relevant. Paul, the Y-axis and the 2 'boxed sides' of the graph frame do produce ticks on the outside (see the graph below) so I assume EXTERNAL_TICKS is already specified. It's the x-axis, which has the ticks internal which I think you're referring to isn't it FK_GER ? The y values are all negative and it looks like you've set the y-axis length to be slightly longer than the section height so that the frame at the bottom doesn't overlay on the dotted section profile ? Why not make y-values all positive and the plot should come out ok with the x-axis at the bottom of the frame ? The y-axis labelling would be better on the outside also. I seem to remember that can be done too with an option. [framed] Adds a box with tick marks as a frame. you'll probably get what you want. Give it a try. Ah the joys of 2 options with almost the same name ! That probably won't be necessary if you use the [frame] option, or at least it will reduce the offset to the 'intended for small adjustments' range which Paul always reminds us about. I'm still surprised FK_GER that you didn't use the CLEARWIN 'primitives' (simply lots of 'Lìnes' in this case) as a few people suggested on your original post to generate the drawing, but I'm sure you've got your good reasons or putting yourself through the 'torture' of using %PL to do it ! Possible Bug ... or my eyes? Paul - it may be my eyes but zooming in on the graph below, to me the ticks on the right hand side of the box look longer than on the other edges !!!! The lower frame edge also appears to be thicker than on the other sides ? Something just to check maybe ? FKGER ... the form of the link you posted is incorrect. To get the image to appear on the post directly you need to use the link provided on the Postimage page. Click on 'Share' and the links will pop up. Use the next to bottom one 'Hotlink for Forums'. As DanRRight has previously noted, you actually don't need the outer [URL] bits, you can just use the part of the link within the '[IMG]' and '[/img]' (inclusive of those tags). Whether or not it is the case here (about the ticks being different lengths) such effects may be the result of converting real coordinates into integer pixel coordinates. In the worst case, you can be out by a pixel at each end, and this shows up on a low resolution device like a screen, but not on a high resolution printer. A further advantage of using the graphics primitives is that you can fill areas in colour. 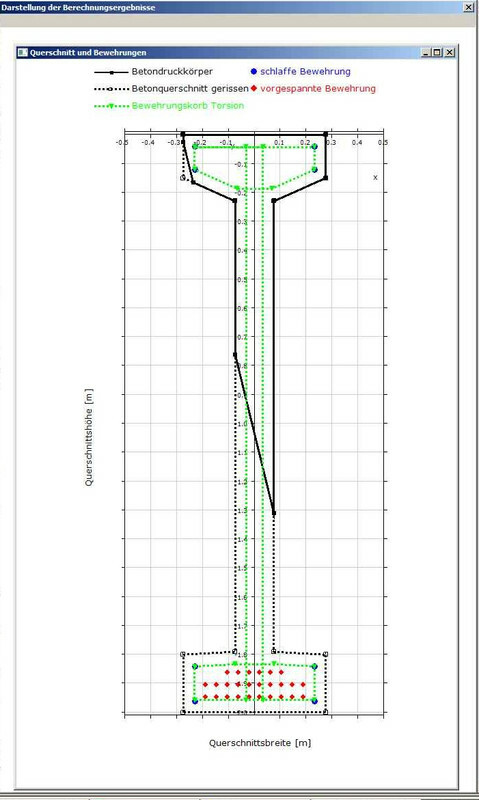 The shown plot is a part of a program to calculate the stress limit of an reinforced concrete cross section. This program works with an right orientated, three-dimensional x-y-z-coordinate-system, where the x-axis is the longitudinal axis of a girder and the cross section lays into the y-z-plane. This means for a top view of the cross section, that the positive y-axis runs from left to right and the positive z-axis from up to down. The origin of the coordinate-system lays in the middle of the upper edge of the cross-section. All input- and output-data of the program is done in this coordinate-system. To keep these settings for drawing the cross-section as shown, the y-data is plotted in x-direction and the z-data in (-y)-direction. In doing so the numerical data in both directions is correct, except the sign for the y-direction. I've tried already a version with z-data in (+y)-direction - no problem after an equivalent coordinate transformation. But then the x-axis and the origin too is at the bottom of the cross-section. Now the numerical data in x-direction is correct indeed, but in y-direction the the numerical data runs from down to up. For the program user is this confusingly. All data is available and specified correctly. The settings CALL winop@("%pl[y_min=-2.0,y_max=0.0]") causes, that the lines and symbols, which are laying on the border/frame directly, are clipped. Only the part inside frame is drawn. This was in Version 8.1 not the case! Is it possible to prevent the tick-numbers of both axes? Then I couldt set my own tick-numbers outside the frame e.g. with CALL draw_characters@ . KL, you've used [external_ticks] which implies [framed] i.e. it's assumed as a consequence. Try replacing the option [external _ticks] with [frame] ( no 'd' !) and you should get what you want. I think ! Eddie, tick lengths are defined in pixels so no rounding should occur. However, it does depend on where the frame edge lines are drìawn relative to the 'points' (pixels) defining them. Logically, a line with an odd number of pixels thickness shouldbe centred arond the 'pixel line' (i.e. symmetric). For even numbers of pixels thicknesses the line can't be put symmetrically about the points (pixels) so there will be 1 pixel offset. Now, if the rh and lh frame edges are offset by one pixel the 'same side' of their respective lines then when ticks are drawn on one side they will appear to be a pixel different. In fact they're not, they're just an extra pixel hidden by the thickness of the line on one side. There's another possibility and that is that the lines are always drawn completely (except 1 pixel) to one side of the points (pixels) line). That would make the diference in tick lengths APPEAR much more different. The best way is to draw the frame edges as 'mirror reflections'. i.e. whatever the offset philosophy the left hand frame line should be offset towards the outside (to the left of the nominal pixel line, and the rh one similarly offset thìo the rh side of it's pixel line. Paul could confirm how the lines are actually drawn as of today to confirm this 'theory'. It shouldn't be that difficult to change. Seeing what I saw in that graph is disconcerting. It could be worse for other frame line thickness (much thicker). John, I've tried your proposal and replaced [external_ticks] with [frame]. Many thanks, it works! The only defect is the negative sign of the numbers in y-direction. I hope the code is self-explanatory; gca means "get current axis"
My question at the experts: Exists a similar way in the used fortran too? My recommendation would be to use %gr, rather than %pl. You would have much more flexibility with layouts. Just divide the annotation tasks up and write routines for each task. It has to be easier that trying to contort the problem to being a graph. It should not too hard to draw a grid; draw a section; draw reio bars; draw shear bars; annotate section etc. Start small then add features to each routine. TRY setting the ticks spacing [dy=yy] (and/or [dy=yy] - see below) to be GREATER THAN the height of the section (i.e.the whole range of the vertical axis) ! Then if it works you should get no tick marks, or probably just the one at the origin) (and hence no labels) at all and you can DRAW_CHARACTERS to your hearts content to create your own axes ticks and labels. Much depends on how the internals of native %PL work since I don't think there's a way to fix the size of the actual graph area so it might try to accomodate in some way with peculiar results as a consequence. There's only one way and that's to try it and see ! b) option to choose the orientation of the plot on screen including the option to have non-Maxwell axes !!! (i.e just one axis 'flipped' about the other (which would be convenient for what you want here I think). If you have simple code that illustrates these "simple bugs" then please post the code so that they can be fixed. I'm surprised you don't remember them Paul. You just have to go through all the Native %pl posts (I think there are 3) to see them, with the various codes posted there by several people. Why not start by getting the x-axis labels to always be centred. Or the log scales to be 'fool-proof'. For example. I did suggest at one point that we needed some kind of 'running list' of outstanding bugs to be maintained. But it fell on deaf ears at the time as I rmember. Do you have time on your hands to deploy some effort in that direction now then is that what you're telling us? Maybe we should have a dedicated Native 'Native %PL Bug Fixes' post to centralise them on? Of course it all depends on the definition of 'simple bugs' for you doesn't it. Oh, what about the regular overlay of y-axis captions over the tick labels (depending on th format of those labels for example. Or a really simple one - whydoesn't the origin (0) of the co-ordinate syatem always get labelled. How do you want to organise this, bcause it needs some organising or we'll run round in circles again I'm sure and be back here in 6 or 12 months time. If you can provide new short and simple programs that illustrate these "faults" one at a time then I will try to find time to look at them. You will have to make it easy for me. There are too many other demands on my time.